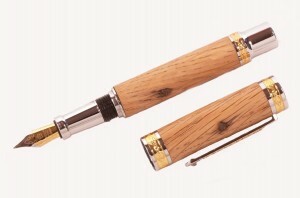 The Empress range feature some exquisite detailing and offer terrific value when compared with similar pens available. A Swarovski crystal is inset into the clip and attractive Asian style 14ct gold plated bands encircle each end and the center of the pens. The fountain pen has a gold and rhodium plated nib. These pens are a joy to use and would be a truly remarkable gift.